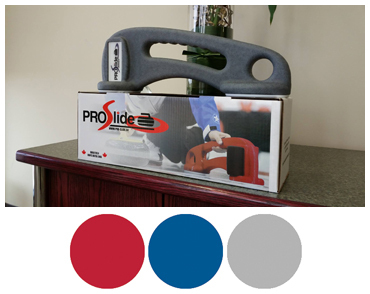 Proslide’s design is the result of months of consultation with professional and amateur curlers, followed by prototyping and testing. This has resulted in a truly innovative professional level delivery aid for the curler who wants to improve their delivery technique and gain better control and accuracy. Its patented design and unique features make it appropriate to all levels of curlers. It has been designed to meet the ergonomic requirements of a sport that demands consistency and accuracy in delivering a curling stone on target. Manufactured from impact resistant polyethylene to ensure durability and guarantees years of use. Same height as a curling stone, creating level and square shoulders at release. Handle is designed with multiple gripping positions depending on curlers size and preference. Device surface is mottled for a clean finish, while also providing a secure grip. Glides on two Teflon pads, similar to most shoe sliders. Foam brush mounted on one side for ease of use in cleaning ice, prior to delivery. Light weight, yet will withstand up to 300 pounds of top force.